The French call French Tarragon, Herbe au Dragon. Indeed, the word Tarragon is thought to be a poorly pronounced French word Esdragon. The French got their Dragon monikers from the Latin species name for French Tarragon which is dracunculus. Roughly translated this means little dragon. And, while there is a lot of written speculation that the dragon part refers to some ancient use of this herb to cure bites and stings of all manner of creatures. More likely, it refers to the fire it leaves on your palate. A chef's best friend and a must for every Herb Garden, French Tarragon has spicy anise flavor that turns ordinary main dishes into masterpieces. Tarragon goes well with meat and vegetables and is a top choice in any hearty recipe. It is traditionally one of the constituents of the herb blends 'Fines Herbes'. Herbes de Provence, and Bouquet Garni. Although the licorice taste in Tarragon's flavor is copied quite well in the plant Tagetes lucida (Spanish Tarragon), French Tarragon is spicier and works better as a choice for main dishes. 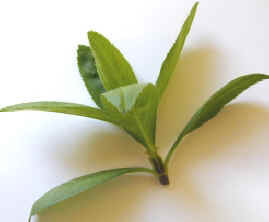 Spanish Tarragon is sweeter and compliments rice or desert dishes. 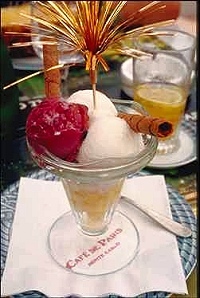 Recipes like Lemon Tarragon Sorbet can make use of either Tarragon, each producing a subtle taste difference. In a small saucepan, bring the water and sugar to a boil over high heat; stir to dissolve the sugar. Chill. Add the lemon juice, tarragon and lemon Verbena. Freeze in an ice cream maker according to manufacturer's directions. Reprinted with permission from A Celebration of Herbs. Like all Artemisias, French Tarragon likes life on the dry side with plenty of sun. The soil should be well drained and watering should be thorough. Keep a good supply of fresh tips for cooking by cutting it back to the ground several times during the growing season. It should be divided every year in late summer or in spring when it is rapidly gowing. It also makes a good choice for growing in a container. Every year a cousin of French Tarragon manages to find its way onto nursery shelves. 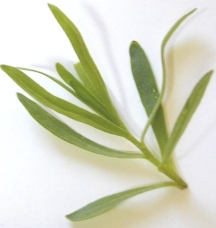 Often just labeled Tarragon, it is actually a tasteless variety most often referred to as Russian Tarragon. Why you ask would any one bother to sell a tasteless culinary herb? Because it can be grown from a seed instead of a cutting which is preferred by commercial growers. French Tarragon rarely blooms and, even then, makes only sterile seed. Many times herbs are produced by large nurseries that do so many other plants, like junipers and pansies, that they don't take the time to know their herbs. Just remember your Tarragon should breathe fire like a little dragon. 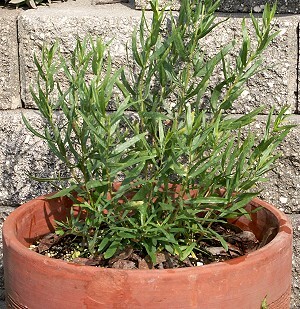 French Tarragon makes a tasty addition to our Kitchen Herb Garden Six Pack and our Small Space Herb Garden Six Pack. and will have inferior flavor.